We probably all have some outdoor clothes made with plastic microfiber – a fleece, some thermals, a hat? This podcast from the BBC investigates the contribution of plastic textiles to the increasing levels of plastic waste in the environment. And potential ways forward. It can sometimes be hard to get out of the house to attend a Committee meeting. 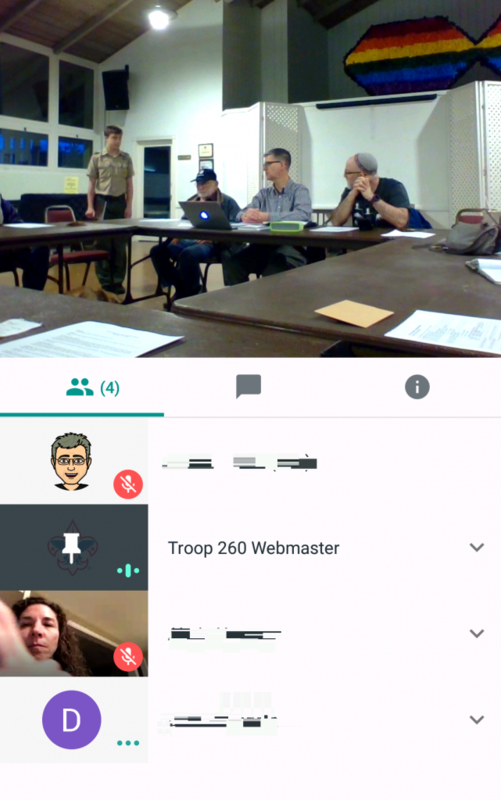 At Troop 260 we understand that, and are trialing ways that families and committee members can participate in our monthly meetings remotely. Tonight was our first effort – and we managed to have a couple of people on throughout the whole meeting despite some flaky wifi. Partial success and something to build on for next month! 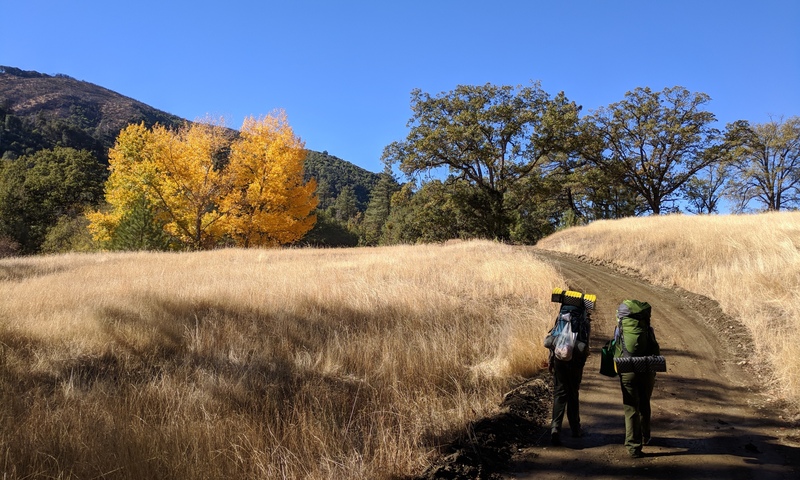 As a California Troop we are generally fortunate to not encounter the rain and snow on a regular basis. However, there are clearly times in the year when we do and anyone in the Troop (including participating family members) needs to Be Prepared for wet weather. This short brochure from outdoor clothing company Marmot has some good insights into gear and sound advice on wet weather clothing and how to use it to best effect (the only advertising is background). Everyone was well prepared, with waterproof gear, changes of warm clothing and navigation. To our pleasant surprise the rain largely stayed away and we enjoyed a fabulous 12.5 mile loop trek through some stunning woodlands. Overnight was cold, about 35F/2C but everyone fared pretty well, some pulling on their extra clothing layers. Possibly the 3 packs of Oreos consumed after dinner helped provide some of the Scouts with the energy they needed to stay warm! 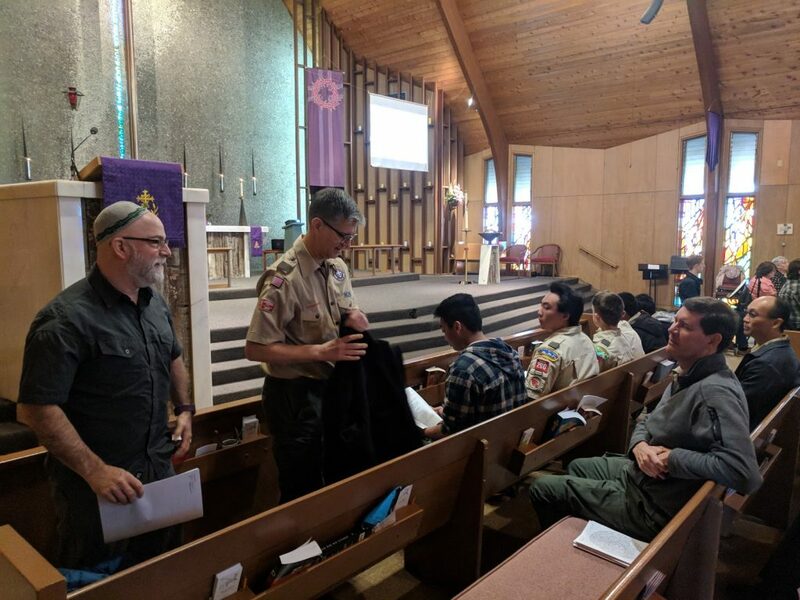 In the second of our activities supporting the “a Scout is reverent” part of the Scout Law, we attended a Sunday service at our Charter Organisation – Christ the Good Shepherd Lutheran Church. CtGS has been a strong supporter of the Troop over the years, especially in our efforts to ensure Scouting is as inclusive as possible and open to all youth, irrespective of sexual identity or gender. It was great to be there to learn about their congregation and how they worship. Pastor Manda spent 40 minutes with us afterwards to answer questions on Lutheranism and Christianity. Here at the troop we are very fortunate to have the support of a master farrier and blacksmith – Ken Brundage. Ken has coupled his skills and Troop 260 Scouts’ attachment to quality knives to form a new reward program. 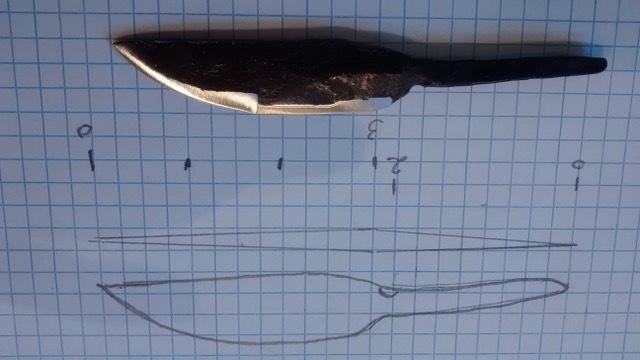 Now every scout obtaining the rank of First Class (or higher) will get to make their own sheath knife on the forge up at Camp Chesebrough! This year’s summer 50-miler is going to be backpacking The Lost Coast in Northern California. Due to permit restrictions the size of our group can only be 15: at this time we have 11 to 12 youth + adults committed, so please notify Scoutmaster Scott if you are keen to go! To whet your appetite, and also as a reprise for those that attended, check out the photo gallery from our canoeing expedition to Boundary Waters Canoe Wilderness Area in 2017. We’ve all been in the position of needing to secure, hold-up, join something using some rope or a line. How often do we fallback to one of our basic stalwarts (what problem can’t be solved with a combination of a square knot and a half-hitch, right!)? Thanks to deputy Committee Chair, Mark Cahn, for the link. We are ready to welcome female youth to Scouts!